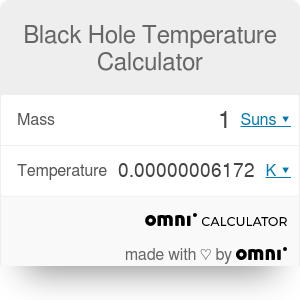 The black hole temperature calculator allows you to calculate the black body temperature of a black hole in a dark, cold environment. A black hole is a massive object with very special properties, one of them is the relationship between its temperature and its mass (or the other way around) when considered as a black body. This relationship is what allows this calculator to exist and provide a simple tool to better understand the properties of black holes. To understand the black hole temperature calculator, we first need to explain what is a black body. A black body is a theoretical object in physics that absorbs all radiation that gets to it. 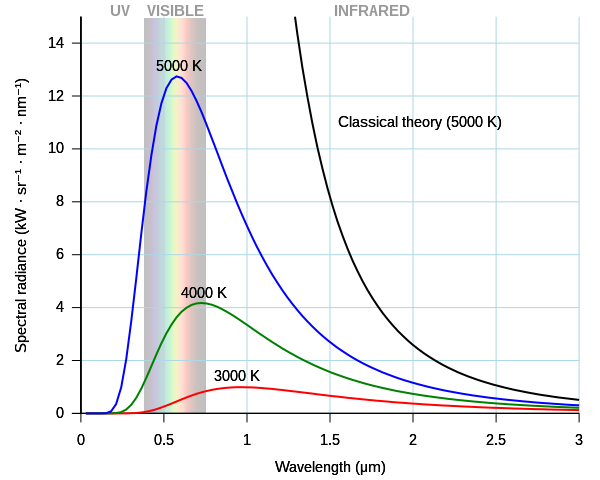 The temperature of this black body depends on the amount of absorbed radiation and determines the frequency and intensity of the electromagnetic radiation that it emits back. A black hole is an almost perfect black body and as such follows similar rules of emission and absorption. As a black body, a black hole has an emission pattern called Stefan-Boltzmann distribution, as shown in the image below, that depends on the temperature. Since the temperature of a black hole (or its first approximation) depends on its mass, you can predict how a black hole will emit radiation, the so called Hawking radiation, just knowing its mass and using the Stefan-Boltzmann law calculator. This calculator was built precisely for this purpose, allowing you to obtain the temperature (and thus the emission spectrum) of a black hole by just knowing its mass. The emission mechanism of a black hole is a very complex process that was first theorized by Stephen Hawking and it involves complex quantum mechanics, the uncertainty principle (and the spontaneous creation of particle pairs). As a very simple and fast explanation, you can imagine a pair of particles created on the edge of the event horizon so that one of the particles can escape the black hole whilst the other gets trapped inside. To learn more about this process and the event horizon, we shall point the reader to the Wikipedia articles on Hawking Radiation and the Event Horizon, as well as to the Schwarzschild Radius Calculator and its explanation of how the event horizon is defined and its importance. One of the surprising facts about the Hawking radiation is that it increases as the size of the black hole decreases. This result constitutes one of the most mind-boggling pieces of Hawking's work; since the conservation of energy together with the emission/radiation process leads to only one possible conclusion (again, in a very simple and very incomplete statement): "All black holes evaporate and they evaporate faster as they get smaller". This black hole temperature calculator provides a very simple and quick way to obtain the temperature of a black hole form its mass or vice versa. M is the black hole mass, which due to the typical size of such objects in the universe is commonly expressed in solar masses. To use the black hole temperature calculator, it suffices to input either the mass or the temperature of the black hole to obtain the other parameter. It is important to note that typical black holes have a mass of at least several solar masses, but it is also interesting to see what would happen in the case of much smaller micro black holes which have been theorized but never experimentally observed, because of how fast they evaporate (amongst many other reasons). As we can see from the example above, the black body temperature of a typical black hole is very low, that is they emit a very small amount of Hawking radiation, which explains why black holes in the universe seem to exist forever. It is also important to realize that this temperature-mass relationship holds only when there is no radiation absorption by the black hole, i.e. in a dark and cold environment very similar to the darkest parts of the universe. In reality, many of the black holes found in the universe do absorb and interact with other massive objects, and hence their real temperature is different from the black body temperature. Black Hole Temperature Calculator can be embedded on your website to enrich the content you wrote and make it easier for your visitors to understand your message.